Boo! A frame for you! How cute is this little frame?? It came about after seeing something similar on Pinterest & I knew I had to make my own. 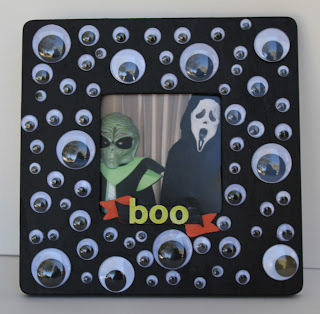 The supplies to make this frame are cheap: a $1 wooden frame from Michaels, a tube of Martha Stewart Black & Orange Paint, leftover googley eyes from past craft times, a chipboard Maya Road banner, and leftover Sass-a-frass Lass letters from a Studio Calico kit. I used gluedots to hold the eyes onto the wooden frame. Easy Peasy. Ben actually served as my 'Chief Eye Gluer-Downer' and loved this job. We got to talk and catch up - which is hard to do with an almost teenager! I so enjoyed our afternoon working on this project! This weekend is Alex's and my 'BIG' March of Dimes Gala weekend. Marcy's story is being fetured on the news tonight at 6 & 10, and then tomorrow at the gala, they will show a video of Alex and I talking about what it is to lose a child to prematurity. We. Are. So. Honored. AND extremely nervous. It is scarey to put yourselves 'out there' to complete strangers, and hope they see the importance of fighting for the littlest people in our lives. Alex is going to be wearing a tux - and oh!, how handsome he is in it. I am a lucky girl. I am debating between two dresses (yes, still debating)....but this one is currently in the running. It has three simple rosettes in the center of the waist - looks good on me (and hides my tummy and hips). Alex LOVES this dress, and its probably the one that will win out tomorrow. I will post pictures and let you know what I go with!